I'm a dog mom and concert junkie. You can always spot me near the food table at any party. I spend my free time finding new tunes for my Spotify playlists or pinning drool-worthy recipes from Pinterest. I know how to cut a rug like nobody's business. They don't call me "Happy Feet" for nothing! We all have that one celebrity we idolize because they have great hair, makeup or fantastic style. I don’t know about you guys, but I have always loved The O.C. star, Rachel Bilson. She has fantastic street style and always looks on point even when she is out running errands! The Rachel Bilson style is laid back and tomboyish, but with a feminine twist (exactly my kind of thing!). I am a fan of Rachel Bilson’s style because her outfits are really well thought out and since she is a petite woman like myself, I can relate to her in a lot of ways. If you are one of those unfortunate souls that are under 5′ 5″, you know how painful shopping can be. NOTHING fits. Things are simply too long or sit weird on your body because you don’t have a long enough torso. #shortpeopleproblems. Well my friends, aside from knowing a great tailor, Rachel also knows how to pick out clothing that compliments her small frame. This is something that I have really tried to be more mindful of when I go shopping because I don’t want to look like I’m drowning in my clothes which can make you look really frumpy. 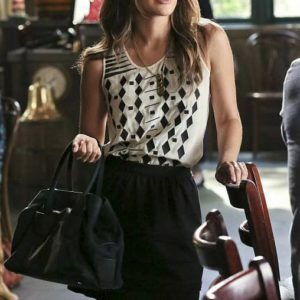 Since Rachel’s style is fairly easy to recreate, I have picked a few of my all time favorite Rachel Bilson style “street looks”. You can find most of these pieces at stores like Urban Outfitter or ASOS (which has a petite line – score!). Why I love it: Rachel pulls of this maxi dress perfectly. I love the combination of the sheer dress with the moto jacket. Why I love it: This outfit is the perfect combination of feminine tomboy and its great for those cooler summer days. Why I love it: This outfit is great for fall! The boyfriend jeans and sweater jacket work really great together. Why I love it: This is another great casual outfit that she has dressed up with heels. This could work great for a afternoon date or lunch with the girls.